Is this a classic case of Jews funding both sides of the war? AGAIN? You bet it is. Mr. Soros gave at least $33 million in one year to support already-established groups that emboldened the grass-roots, on-the-ground activists in Ferguson, according to the most recent tax filings of his nonprofit Open Society Foundations. Mr. Soros spurred the Ferguson protest movement through years of funding and mobilizing groups across the U.S., according to interviews with key players and financial records reviewed by The Washington Times. So what can we do to save our Republic from these moral monsters? 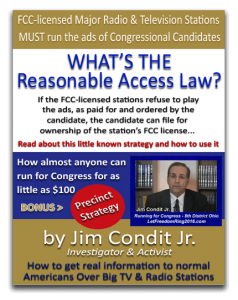 Join the Precinct Takeover and take back the power starting at the state and county level. 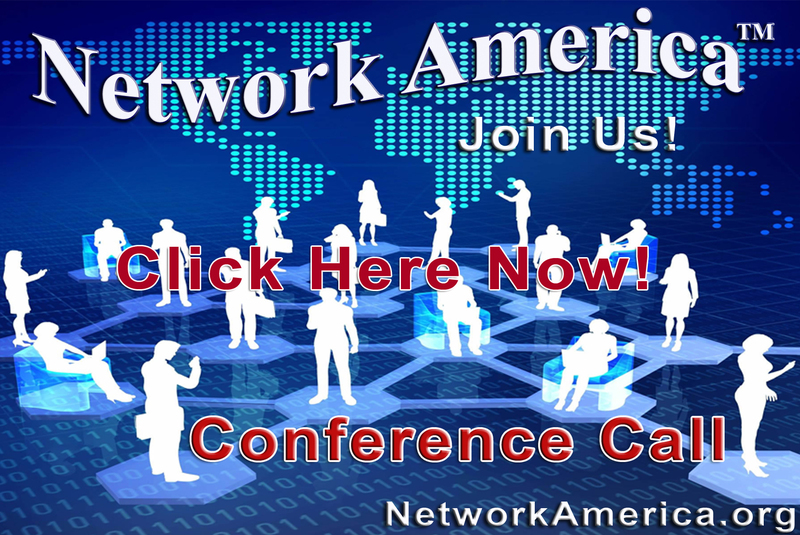 Find out about the project and check the conference call schedule here! 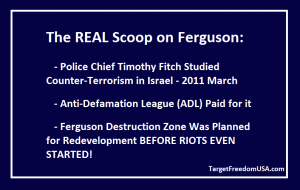 The Israelification of American Law Enforcement; ADL Funded & Redevelopment of the area in Ferguson was planned long before the riots! America’s law enforcement has been training in Israel for years with the IDF (Israeli Defense Forces or more appropriately the Israeli Death Forces) and the Israeli police. This fact has been reported in the main stream media, but when you bring this issue up many people tend to attack you and suggest you go put on your tin foil hat. 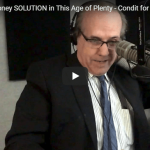 Why shoot the messenger? What is the harm in looking at facts? How are we supposed to fix the police state, stop the illegal wars based on lies and gain some semblance of the Constitutional Republic our Founding Fathers fought and died for without looking at facts? The recent killings and police brutality against its own citizens in America and the stripping of all things Constitutional and Bill of Rights like in Ferguson, MO has shed light on this alarming situation. Once again we have evidence of the brutal Police State in action, protest provocateurs and all! 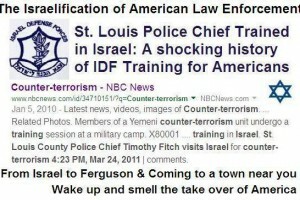 Records dating back to at least 2011 show that St. Louis Police Chief, Timothy Fitch made the pilgrimage to Israel for training along with other law enforcement officials around the country. Why would our civil servants be training with one of the most vicious and racist military forces on the planet? 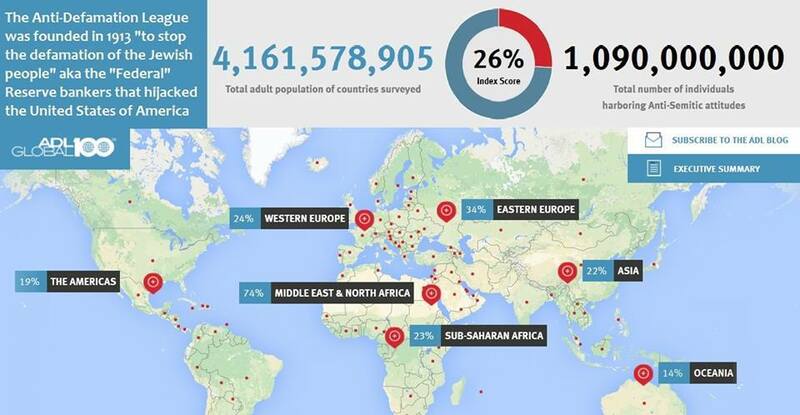 Are we the new Palestinians in our own land? Cop Block has been keeping track of the police brutality, raids, and the killing of our innocent citizens and pets on a daily basis, the numbers are shocking! Not only do our law enforcement officials make this traitorous pilgrimage to Israel where they are wined, dined and compromised while learning brutal anti-American torture tactics, but our politicians make this same obligatory rite of passage sporting little Yamakas and all. This is critical information every single American needs to know. We need to push back against this destructive Anti-American Zionist Israeli machine that has infested and infiltrated our country in every critical power structure before it is too late. Wake up and smell the takeover America! One of the most shocking aspects of this nefarious training program is that it is being funded by the ADL and other Jewish organizations. With the United States on constant terror alert since the events of September 11, 2001, American police and law enforcement officials are taking advantage of Israel’s expertise in various facets of counter-terrorism and first response to better protect the American people. 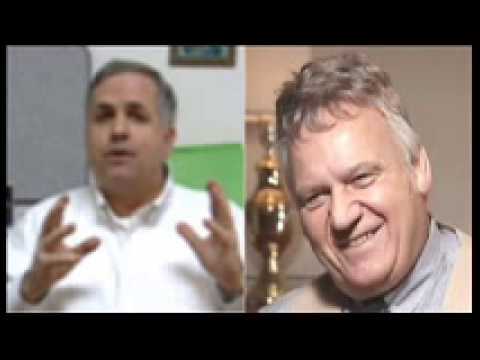 In 2002, Los Angeles Police Department detective Ralph Morten visited Israel to recieve training and advice on preparing security arrangements for large public gatherings. From lessons learned on his trip, Det. Morten prepared a new Homicide Bomber Prevention Protocol and was better able to secure the Academy Awards presentation. In January 2003, thirty-three senior U.S. law enforcement officials – from Washington, Chicago, Kansas City, Boston and Philadelphia – traveled to Israel to attend a meeting on “Law Enforcement in the Era of Global Terror.” The workshops helped build skills in identifying terrorist cells, enlisting public support for the fight against terrorism and coping with the aftermath of a terrorist attack. Also, in 2003, the U.S. Department of Homeland Security established a special Office of International Affairs to institutionalize the relationship between Israeli and American security officials. “I think we can learn a lot from other countries, particularly Israel, which unfortunately has a long history of preparing for and responding to terrorist attacks,” said Senator Susan Collins (R-ME) about the special office. In November 2011, a delegation of senior American law enforcement officials, including police commanders, security experts and FBI agents, went to Israel for a joint training seminar with Israeli counter-terrorism officials sponsored by the Anti-Defamation League. Israeli Police spokesman Micky Rosenfeld said the program provided the visiting officials with an opportunity to “learn from each other and their Israeli counterparts.”The program covered topics such as border security and media response during crises as well as overviewing strategies for treating mass casualties, performing rescue operations and establishing command and control at the scene of a terror attack. In early September 2012, the New York Police Department (NYPD) opened an Israeli branch at the Sharon District Police Headquarters in the Israeli coastal city of Kfar Saba. The NYPD decision to open an Israeli branch rested on the fact that the Israeli police is one of the major police forces with which it must maintain close work relations and daily contact. UPDATE: BUSTED! 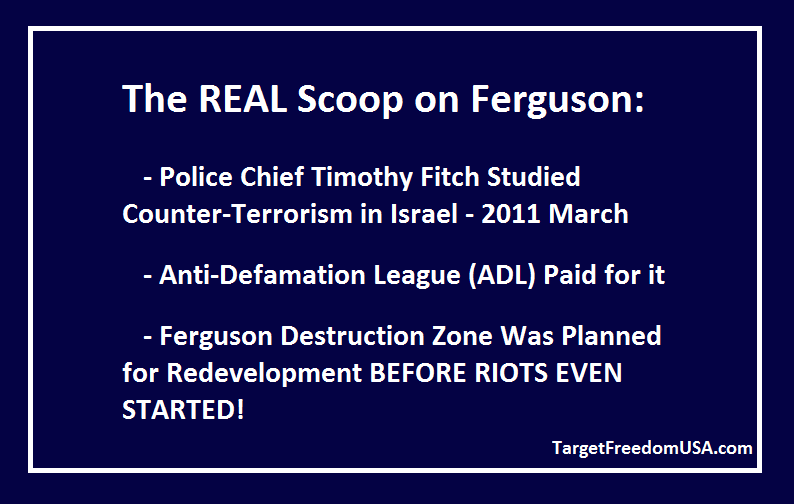 Ferguson Destruction Zone Was Planned For Redevelopment BEFORE RIOTS EVEN STARTED! Proof! On the night of November 24, 2014, St. Louis County prosecutor Bob McCulloch’s announcement of the grand jury’s decision not to indict Ferguson police officer Darren Wilson in the shooting death of black teen Michael Brown, was followed — predictably — by rioting, looting, and burning in Ferguson and environs. Note: Ferguson is a suburb of St. Louis, Missouri, and part of the Greater St. Louis metropolitan area. To the east of Ferguson are Dellwood and North St. Louis County. Like the four stores above (Advance Auto Parts, Fashion R, TitleMax Title Loans, Little Caesars), most of the businesses that were looted, vandalized, or burned to the ground were in a two-square-mile block on or near Florissant Avenue — Ground Zero of the Nov. 24 riot. Two years before Officer Wilson shot Michael Brown, setting off a series of protests and riots that culminated in the Devil’s Night of looting and arson on Nov. 24, 2014, there was already a plan — the Saint Louis Great Streets Initiative — to redevelop and revitalize the West Florrisant Avenue corridor. In the spring of 2012, elected officials, staff, and residents for the cities of Dellwood, Ferguson, Country Club Hills, Flordell Hills, and Jennings, along with representatives from St. Louis County Highways and Traffic and East West Gateway Council of Governments formed the West Florissant Avenue Committee, recognizing the need for the revitalization of the West Florissant Avenue corridor. The redevelopment strategy for this corridor focused on a 4.5 mile segment of the arterial roadway, beginning south of I-270 and continuing southward through the listed five municipalities, concluding at the city limits of Saint Louis City. The fundamental goal of this collaborative effort was to compose a strategic plan for the redevelopment of West Florissant Avenue corridor that would significantly improve the quality of life of the individuals who utilize the thoroughfare and also to transform the area to allow increased accessibility and support long term economic development within the corridor. The City of Dellwood, in partnership with the City of Ferguson and St. Louis County Highways and Traffic has been awarded funds by East-West Gateway Council of Governments for the redevelopment of the West Florissant Road corridor. How convenient for the St. Louis Great Streets Initiative that the riots did part of their (demolition) work by destroying the businesses along the W. Florissant Ave. corridor, burning some stores clear to the ground! How convenient for the St. Louis Great Streets Initiative that public donations and state and federal dollars will now pour in to redevelop and rebuild those destroyed businesses along the W. Florrisant Ave. corridor! Now I finally understand why Missouri Gov. Jay Nixon, although he had already called up the National Guard a week before, held back those same National Guard troops on the night of Nov. 24, in effect giving free rein to those rioters, looters, and arsonists. Missouri Lieutenant Governor Peter Kinder has accused Nixon of holding back the troops because of pressure from the Obama administration and Attorney General Eric Holder. Now I finally understand why firefighters in Ferguson did not immediately respond to calls to put out the multiple fires that burned so many businesses to the ground on the night of Nov. 24. “Was Sandy Hook Elementary School already abandoned before the massacre?” — on the school having been condemned for asbestos and other environmental pollutants years before the alleged massacre. Don’t forget to follow the D.C. Clothesline on Facebook and Twitter. 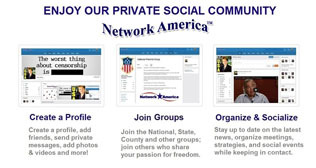 PLEASE help spread the word by sharing our articles on your favorite social networks. American Politicians Pilgrimage to Israel, why do they do this? Ron Paul never did this. Eran Efrati an ex-Israeli Soldier whose father is a Police Chief in Israel tells about American law enforcement around the country training in Israel with the IDF and Police. Click to watch the last few minutes of Eran’s shocking lecture. I don’t recall the original source, I had grabbed the follow info and put in my notes for this article. If anybody knows the source of the info below, please contact me so I can cite it properly. Instead of a knee-jerk reaction by those wishing to incite a race war, why don’t we try to understand the root causes of the militarization of the police in the US, i.e. violence towards US citizens, the brutalization of the American psyche, and what appears to be preparations being made for war to be waged against Americans? We need to understand how 9/11 created this mass psychology. That in the wake of 9/11 (inside job), the PATRIOT Act US police state, Israeli security companies have played a predominant role in the training of us police forces. Police who now treat ordinary Americans as if they were Palestinians in the occupied territories, neighbors who now are being treated as enemies. Has Jewry Infiltrated the Local Police? Israeli Company Has FAA Permission to Fly Drones in U.S. Airspace! Meanwhile, the Zionists who predominate in state and federal government are moving to protect themselves from backlash… California passes resolution defining criticism of Israel as anti-Semitism. 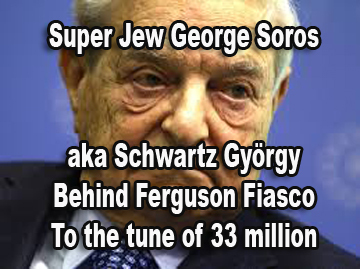 Pingback: Sinister Jew George Soros aka Schwartz György funded Ferguson Fiasco !!! – Target Freedom USA™ | I Know it's Crazy but…..
Satan leaves no stone unturned! Jesus warned us to be vigilant! Satan leaves no stone unturned! Jesus warned us!